Whenever I shop for makeup I tend to gravitate towards eye shadows, blush, highlighters, and all those products filled with shimmery goodness so I have a very meager collection of lipgloss since I prefer cream finishes. So it's quite amazing that I have three glosses from the Revlon Super Lustrous line even though I rarely skip lip products. These lipglosses are definitely familiar to many of you already since they are considered one of the best lipglosses available at the drugstore, retailing at around $7 to $8 a pop. I got all of these at separate occasions but I seem to keep coming back for more! I bought Pink Whisper when I was first getting into makeup more than a year ago and I thought the light pink color was easy to wear and the micro shimmer was pretty. To be honest I have not worn this gloss very often but then again I rarely wear lipgloss anyway. This gloss looks nice by itself or over a lipstick and it nudes out my natural lip color quite well. These glosses are pigmented and comfortable enough so that my lips are not dry afterwards. Coral Reef is a bright coral orange which will be great for spring and summer though I have yet to wear this on my lips at all :X Then I recently picked up Lilac Pastelle when CVS had this for 75% off and although this looks quite weird and scary in the tube, it looks amazing on my lips! It transforms into a milky blue based pink on the lips which I love. Oh! Pink Whisper is so so beautiful although I love the three of them! 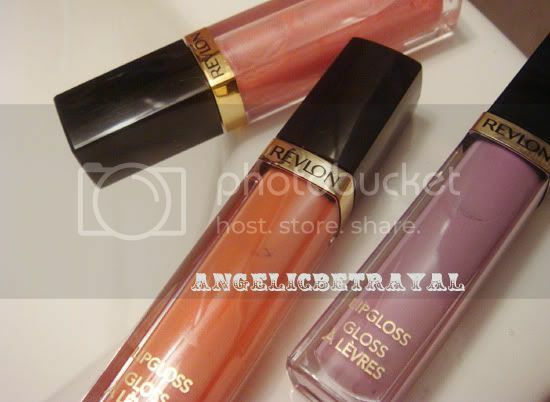 Yes I love revlon glosses, and loved those ones (lilac and coral reef) from the spring collection. I heard they are permanent now which I am so excited about cause they are awesome. 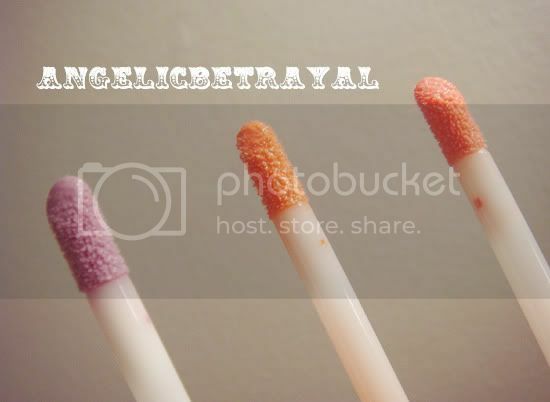 I like wearing Lilac Pastelle under a pink lipstick. It really brings out the pink! I had Pink Whisper but I got rid of it just because I just didn't wear it as often as I'd liked. But I have Life's A Peach and LOVE IT! I have Coral Reef and it turns too orange on me so I don't like it :( But I LOVEE pink afterglow. It's one of my favourite lip glosses!